The Sunday before Thanksgiving I always take a break from whatever we are studying so we can focus on some Scripture that will help stir thoughts of gratitude and thankfulness for who God is and what He has done in our lives. Focusing on gratitude is very important for me because I recognize that there is so much going on in so many of our lives that would seek to pull us down and cause us to lose sight of the gratitude that we all should have regardless of our circumstances or situation at this time. I learned something really interesting this past week. 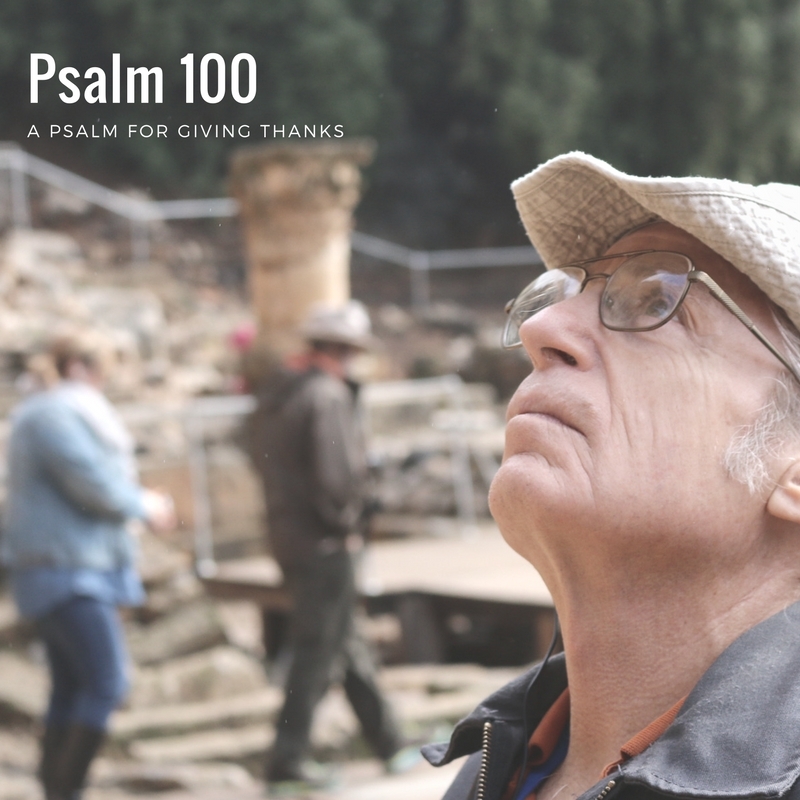 The Psalm we will take a look at, Psalm 100, is the only Psalm that has the title, “A Psalm for Thanksgiving,” or “A Psalm for Giving Thanks.” There are 150 psalms and 117 of them have superscriptions, or titles, to introduce them. The superscriptions sometimes name the author of the psalm, give insight into which instrument should be used when playing and singing the psalm, or group the psalms together. Let me give you an example of how some of the psalms are grouped together. Psalms 120-134 carry the superscription or title, “A song of ascents.” These psalms were sung by worshipers who made their journey up to Jerusalem for one of the feasts to be celebrated. The Psalms are filled with praise, worship, laments, confessions, and thanksgiving, but only one, Psalm 100, is titled, “A Psalm for Giving Thanks,” or as the NIV translates it, “A psalm. For giving grateful praise.” The psalm is made up of only five verses, but those five little verses are jam packed with passionate emotion and deep truth for you and me. Let’s read the psalm and then we’ll see what we can learn. There’s something I want us to notice as we begin taking a look at Psalm 100. Take a look at verses 1-2. In these verses we find the command, or invitation, to praise God. We are called to “shout for joy to the LORD,” “worship the LORD with gladness,” and “come before Him with joyful songs.” Then, in verse 3, we are given the reason for our praise. We know “that the LORD is God,” “He has made us and we are His,” “we are His people,” “the sheep of His pasture.” In verse 4, we are commanded, or invited to “Enter His gates with thanksgiving and His courts with praise,” and “give thanks to Him” and “praise His name.” Then, in verse 5, we are given the reason for our praise: “For the LORD is good,” “His love endures forever,” and “His faithfulness continues through all generations.” The invitation comes in verses 1, 2, and 4. The reason and motivation for our praise comes in verses 3 and 5. Psalm 100 is a powerful roadmap to guide us through this winding, often terrifying, journey of life filled with joy and exuberance at times, but also heartache, disappointment, trials, and sorrows beyond description. It is easy for us to lose hope, to lose the joy and peace that the Lord desires for us to experience in life, and to give in to depression and despair when we focus on our circumstances instead of our God. Let me tell you something. You can travel the world to find the greatest Bible teachers alive today and not hear any greater truth than what I heard sitting and listening to three men who were incarcerated at the time. My friends understood the lesson of Psalm 100 even though they never mentioned it during our conversation. “Shout for joy to the Lord…” The Hebrew word that is translated as, “shout” is “???? ?” (ruwa`), and it was most commonly used for the way the citizens of the city would greet their king who came home after winning the battle. A messenger would arrive before the king and his army announcing the good news. The people would line the streets waiting for the arrival of their victorious king. When he would appear with his army the people would explode with cheers and shouts of victory! You’ve probably never seen the celebration of a victorious king, but you may have seen the tickertape parade held in San Francisco earlier this month when the Giants and their fans were celebrating their World Series Championship. Excitement, enthusiasm, loud shouting, cheering, and unbridled joy were the order of the day as the people expressed their praise and love for their Giants! We are invited to praise our God with enthusiasm and shouts of joy! I love going to Chick fil-A just so I can hear the workers, after they take my order, say, “My pleasure!” Wow! How out-of-the-ordinary is that at fast food restaurants today? I want to give you a sure fire tip on how to get a raise at your place of work. Are you ready? By your actions, countenance, and words communicate a sense of delight in getting to do what you do. If you do that your boss will stand up and take notice. We are to serve the Lord with gladness in the sanctuary and we are to worship the Lord with gladness all throughout the week in everything we do. Come Before Him with Joyful Songs! How could David sing “joyful songs” in such a tough place? He answers for us, “Because your love is better than life…” That’s it. Can I be brutally honest with you? You will never come to fully know the joy that God desires for you as long as you keep seeking happiness, fulfillment, excitement, and satisfaction in what this world has to offer. It is His love that alone is better than life! Enter His Gates with Thanksgiving and Praise! David didn’t flinch in confessing that all of the wealth of their harvest and overflowing vats of wine couldn’t even begin to touch the abundance of joy that the Lord had put in his heart. Are you in that place? Is that your confession today or are you still looking for someone to complete you? Are you still looking for some experience to kick start the humdrum existence you’ve been living? Are you still looking for the golden ticket, for riches to finally propel you to satisfaction in life? It’s interesting to me that so many people, even people who say they are followers of Jesus, roll their eyes and snicker when folks get “too” excited or emotional about the Lord. Stop and think about something for a minute. Do you realize that it is unacceptable in the world’s eyes not to be excited what they are excited about? Let me explain. I’ve been to all kinds of sporting events. I love going, but I don’t get crazy. I’ve been to concerts and I appreciate the talent of those who perform, but I don’t cry and scream their names. That’s just plain unacceptable to those around you at those events. People will give you looks. They might even ask, “What’s wrong with you?” or “Are you not having a good time?” It’s almost expected that you express emotion when you go to these kinds of events, but you better not show that kind of emotion at church on Sunday. The same person who gave you dirty looks for not getting hoarse at the game or the concert will be embarrassed of you if you say, “Amen” or “Thank you Lord” at church. I know why they don’t get as excited about the Lord as they do about watching their team play or checking out their favorite band—they don’t know Psalm 100:3. Take a look at it with me. Please don’t miss this. The emotion that filled the heart and mind of the psalmist as he wrote Psalm 100 flowed from the truth of Psalm 100:3. “Knowing” the truth about who God is: His character and attributes, His unfailing love and constant care, produces joyful songs, thanksgiving, confessions of praise, and service overflowing with gladness. If we don’t know the truth of God then our praises and joy will be “seasonal.” We will only praise Him and sing joyful songs when the sun is shining and everything is wonderful in life. What are the truths that are included in Psalm 100:3? Well, let’s take a look. First of all, YHWH is God. Not Allah, Buddha, Shiva or Vishnu, but YHWH alone is God. There is no other. He has no competitors, there are no rivals to His power and ability. David knew that his life, even with all of the heartache and trouble that he encountered in life, was not a product of happenstance or circumstance, but his life possessed inherent purpose because He was created by God. Oh how I want you to recognize that my friend. There are people who end their life every day because they are searching for some reason to hold on, some hope to carry them through the darkest times of their life. Your reason and hope is found in the fact that you were created by the God who has placed purpose and meaning in everything He ever created. You will find your hope and reason for living in Him alone. Anybody here think that is worth celebrating? Wow! What an amazing, gracious, loving God we serve and worship! “His love endures forever!” There is nothing that can separate you from His love my friend. Is that worth celebrating? The last truth that we must learn and never forget is, “His faithfulness extends to all generations.” Through it all, through everything you’ve ever been through in your life, He has been faithful. He has never left you and He never will. He has never forsaken you and He never will. He is faithful! What’s even more amazing is this: We are not faithful and yet He remains faithful through it all. If you want to celebrate with the psalmist then you must learn the truths about God that the psalmist knew: He is God, He made us, we belong to Him, God is good, His love endures forever, and His faithfulness extends to all generations. If we want to worship joyfully and serve gladly then we must remind ourselves of who this Great God really is. Do you know Him? Do you know who you are because of Him? In just four more days we will celebrate Thanksgiving. This could be a Thanksgiving like you’ve never experienced before if you will come to know these most important truths this morning. Won’t you invite Him in?